Point to Reports in the menu bar and click Statements-Print. Use the Family/Account Search Criteria to tell Jackrabbit which families you want to print a statement for. Use the Transaction Search section to narrow down the types and dates of transactions you want displayed on the statement. Use the Format Options section to create the 'look' of the statement by selecting which family and transaction information to include. Logo, header and footer settings are also customized here. Tip: If you regularly use the same Statement Header and /or Footer, you can create defaults in Tools > Edit Settings > Statements/eComm Receipts. If you need to change the default for one set of statements only, you can edit the header / footer while on the Statements - Print screen. 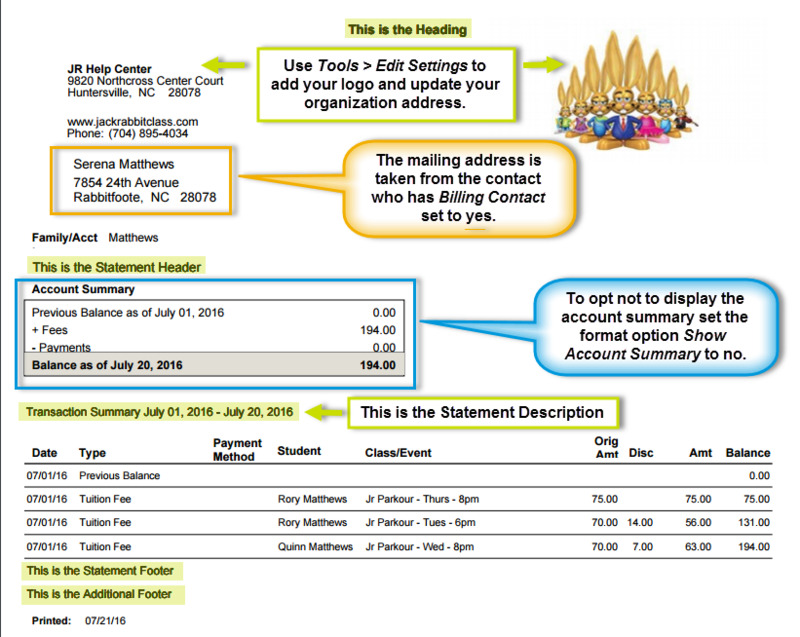 Statements will be created based on the settings you've chosen and open in PDF format, so that they can be printed to 8 1/2 x 11 paper. Printed statements fit into a #10 window envelope for mailing. Time Saver! Create Favorites for frequently used statement settings. See Favorites (Report Criteria Templates) for instructions.